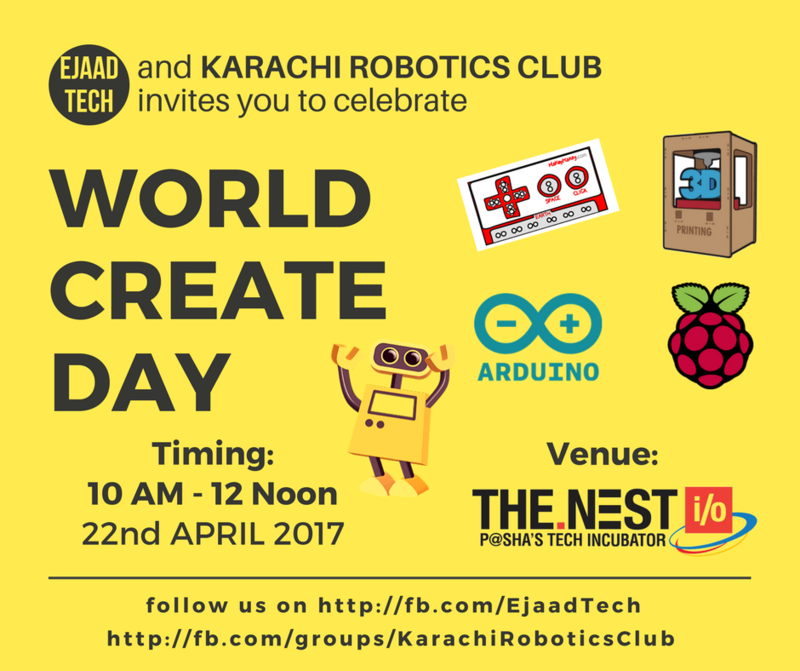 EjaadTech is celebrating World Create Day @ The NEST I/O - join us and enter your ideas in the 2017 Hackaday Prize Design Concept challenge! This event was created on 04/04/2017 and last updated 2 years ago. Our goal is to brainstorm and submit several projects for the Hackaday Prize 2017 " Design Your Concept" challenge. Come join us, help us and we will help you to fine tune and refine the ideas for the submission and then we will be having bi monthly meetups for updates and discussions on those projects right at our Tajurbagah. We started the event at The Nest IO after waiting for some time for participants and to our surprise, there were more parents and kids that joined our event first and then came the other tech people - engineers, software guys and even graphic design artists. among the projects was a shopping helper drone. these kids are making picture of a FIGHTING ROBOT, which has a hammer, can fly using fire (rockets) and also has a force field of current around it. for tomorrow&apos;s event, printed some banners on a 3x10 feet panaflex media. FYI, I like the OLD one more. JUGNU (Urdu for FireFly) Kits - Electronics for Everyone - little box of electronics goodies that anyone can start using, a self-contained and ready to use kit, no sodlering, no wire cutting, no fuss - pure plain old creative electronic fun. Event venue has been changed to The Nest i/o. You are about to report the project "Hackaday World Create Day 2017 at THE NEST I/O", please tell us the reason.